Tough as Nails. During a short rest you can reroll a Hit Dice roll and take the higher of the two rolls. Resistant. Once a day, if you fail a Constitution saving throw you can choose to succeed instead. Tireless. You only need to sleep 2 hours a night to gain the benefits of a long rest. Mul Weapon Training. You have proficiency with the spear, whip, pike, handaxe and unarmed strikes. I think I got the feel of the mul down. The re-roll hit dice thing to me is the highlight of the race. 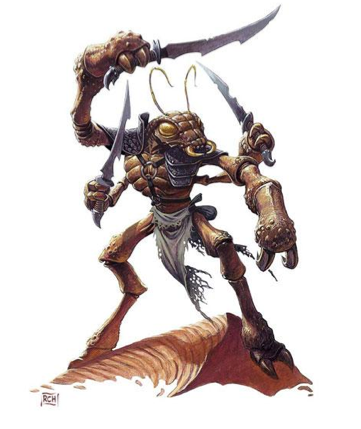 The thri-kreen is an insectoid creature with six claws, also from the world of Athas. I found this one a bit more challenging to translate to a workable race, and it went through various versions. The thri-kreen has a lot of neat things it can do, and there’s a chance of making them a bit too overpowered when compared to other races. They can jump to great heights and lengths, they have psionics, they blend in with their surroundings. Lots of neat tricks, but it can get out of hand. I think I finally cracked that nut after seeing how the Elemental Player’s Companion handled the Deep Gnome’s magic, via a feat, and the talons of the Aarakocra, via a simple proficiency. Long Jumper. You do not need to move any number of feet to make a full long or high jump. Additionally, roll a 1d12 when you make a long or high jump. The result is an additional number of feet you can add to the total of your jump. Chameleon. You can change your color to match your surroundings. You have Advantage on Dexterity (Stealth) checks made to hide in this manner. You have telepathy out to a range of 60 feet. Additionally, you have innate psionic spell-casting ability. This ability allows you to cast mage hand at will, without needing a material component. You can also cast each of the following spells once with this ability: blur, invisibility, and magic weapon. You regain the ability to cast these spells when you finish a long rest. Intelligence is your spell-casting ability for these spells, and you cast them at their lowest possible levels. I am inclined to say that the race is fairly balanced versus other races. The first few versions were a bit overpowered. The claws did many attacks, it had innate casting without it being an optional feat. I am happy with how it came out. I’d love some feedback on these, either here or on twitter (@newbiedm). ← Experiments in building a 5e D&D race: The Shardmind. These are wonderful. Well done. You did a great job of getting some simplicity into them both while still retaining the flavor of the race. Small nitpick, but the Thri-Kreen racial spells should come at designated levels, like Tiefling. Other than that, I like ’em. Svirfneblin Magic Prerequisite: Gnome (deep gnome) You have inherited the innate spellcasting ability of your ancestors. This ability allows you to cast nondetection on yourself at will, without needing a material component. You can also cast each of the following spells once with this ability: blindness/deafness, blur, and disguise self. You regain the ability to cast these spells when you finish a long rest. Intelligence is your spellcasting ability for these spells, and you cast them at their lowest possible levels. These are both great! 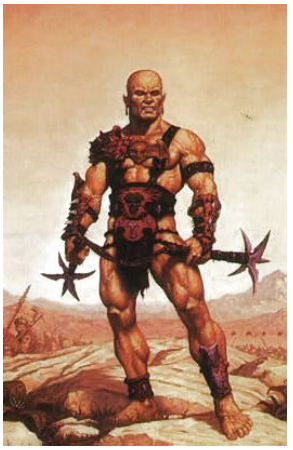 I’m playing a 4E mul, so I’ve been mulling over what they’d look like in 5E, but none of my players are interested, so it’s not a priority. I might focus on different aspects in a build, but this captures the feel nicely. I made different choices with the four-armed Pathfinder kasatha race, when I converted them, using the extra arms to get extra “use an item” actions. I think that thri-kreen and kasatha NPCs should get extra reactions, as well, but monsters are easier to build than player races.